Yes, it's a magnanimous achievement, unattained in the world cinema, creating a history and yet to be broken. Imagine 19 releases in a year as a Hero, quite a stupendous feat, only a caliber of high performing excellence can achieve this. Mithun’s delivery of releases has been bombarding the box offices, like his dialogues in many movies has been imposing and larger than the screen, his achievements also have been sky high. One of the movies that have a dialogue could be discretionary to what he has delivered.Though his dialogue from the film Gunda, “Itihaas badalne waale ka naam, kabhi itihaas mein nahin hota hai (the one who changes history, is the one who never finds his name in history),” holds true for many, but not in this case as he has made a history. Limca Book of records, brings out between its covers, records and achievers flung far and wide in different fields - entertainment, sports, government, business, science, communication, arts - you name it - it is there! The records were an invitation for others to excel. What one individual had achieved, others could aim to do better. The objective was simple- to provide a platform to ordinary Indians to showcase their talent in their search for excellence. Churning out a maximum number of movies in the year with powering performances and massive hits is not an easy task, Mithun Chakraborty, had done it. True to the belief of his fans, Mithunist, Mithun-lovers, Mithunda followers, fans who follow Mithunism, still believe that this breakthrough is still far-fetched and unbreakable by anyone as of now.Unlike the other actors who came with handsomeness, striking personalities, dynasty-related families etc were laid out with welcome-carpets, launch-benefits and path-favors that came on a platter, Mithun didn’t get the desired recipe for success, his hard work, dedication, and commitment paid off. His name will be written recurringly in the flashing-bold letters whenever the history of Indian cinema will be written. The actor danced his way to stardom in 1982 film, Disco Dancer and till today his unique dance steps make him proudly sit on the throne of Bollywood’s ‘Disco Dancer’. Era 1980’s in spite of oldies and veterans who were hanging around like goldies had its own sway with their audiences and movie-goers, Mithunda's spell over the Bollywood audience was swelling and they were getting the hash of his regular release once in every month, believe me, it was like an addiction to the movie-goers. Such was the magic and pull, Mithun became the most loved and preferred actor across the nation through its outstanding performance, dance, and a blazing entry. He had a rare blend of energy, perseverance, popularity and most of his song was played across the nation, inclusive of public places like banquets, gatherings, the Liquor bars, vehicles and disco clubs, which made him easy to connect and remain connected with his fans. 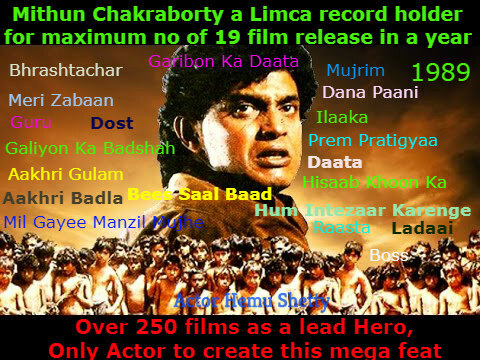 Mithun Chakraborty as a hero is the only lead actor as of now in India who has given more than 18/19 releases in the year 1989, an unmatchable feat which no actor in India has been ever to achieve so much. For an institution from he graduated, one would say that "It’s a proud feeling for FTII to have such an icon its product, who is a successful actor and commercially saleable star". Such an excellence in the field of cinema to churn out a release for the sole objective of delighting the audience, Mithun deserves immense recognition. For this Limca book of records has conferred him an award of being an only actor to get the maximum number of releases as a lead hero in a single year, a total of 19 releases in the year 1989. Mithun Chakraborty is the only actor to have played the lead roles in 249 Bollywood films. He also has the maximum releases in 1989 - 19 films- Limca Book of Records. The records have been attributed and been awarded too, still, it remains unbroken. Limca Book of Records is the Indian equivalent to the Guinness Book of World Records with emphasis on unique achievements of Indians within the country and abroad. It's a salute to all those Indians who want to do something different and be remembered for their distinctive deeds. From the total of 63 Hindi movies released in the year 1989, Mithun as the lead in the same year was 19 movies, accounting for 30 percent of his release in comparison with the yearly release, Absolutely a thumping feat! Apart from few of the above films, rest were average and flops but every film as usual displayed a unique sense of acting in a variety of characters and roles. All 19 movies cannot be a hit, in many cases his own movies released close-to-close was affecting each others business, and movie-goers was too confused which movies to be watched first, this could have affected a good movie to turn out to be an average starter. Producers, directors, and filmmakers were piling on him to be in their films which made him the most bankable actor of the decade. Confirming to the current readers, yes, he was one of the biggest stars of the Hindi film industry in the '80s. Not only a star, he has also proven himself to be an actor of great caliber, a man who juggled numerous projects and oppressive expectations for a long time. Also, he has acted in many regional films after stepping out of the respectable dome he had created for himself in the Hindi film industry. Few actors are doughty enough take such risks. In one of the various interviews, Mithun was asked, what inspires him, as dance being paramount of his performance answered “‘Inspired’ means people from whom I have learned. Elvis Presley, Michael Jackson, Fred Astaire. 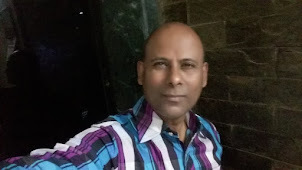 I used to emulate and imitate them.“ True Mithun like his idol Fred Astaire was a virtuoso dancer, able to convey light-hearted venturesomeness or deep emotion when called for. His technical control and sense of rhythm were astonishing. Much has been written about this actor, but nothing seems to be prominent as he caters to a different set of genre whose only belief in him is that ‘Mithun is a mass entertainer’ But what remains an unknown fact for many is that before rising to fame with “I am a disco dancer”, his impeccable acting skills brought him accolades in his debut movie, Mrigayaa (1976). Mithun Da won the first of his three National Awards for Best Actor for Mrinal Sen directorial Mrigayaa. While many gushes over his dancing style and try to recreate his iconic steps on the dance floor, only a few are acquainted with his story of rags to riches which is a perfect example of patience and hard work winning over every other negative force. Mithun truly had an intrinsic quality of connecting the masses, an inborn essence, his moves, groove, and grace was so touching that it moved every heart and made the person reach out to him either physically or emotionally. Dance became his communication mode with the audience and stayed with them throughout. At the peak of his struggle, it was just 3 to 4 releases every year, the number grew as the years grew and more popular he became; dance, swag, style with grace, and action was the only highlighting factor in each of his movies. However, the big change came when he became a sensation after his role as a street dancer in Disco Dancer attracted eyeballs in 1982. Owing to the popularity of the new kind of music that was fast taking over the film industry, the producers cashed in on the lad's surprising rise to fame and the wild popularity of the disco tunes. 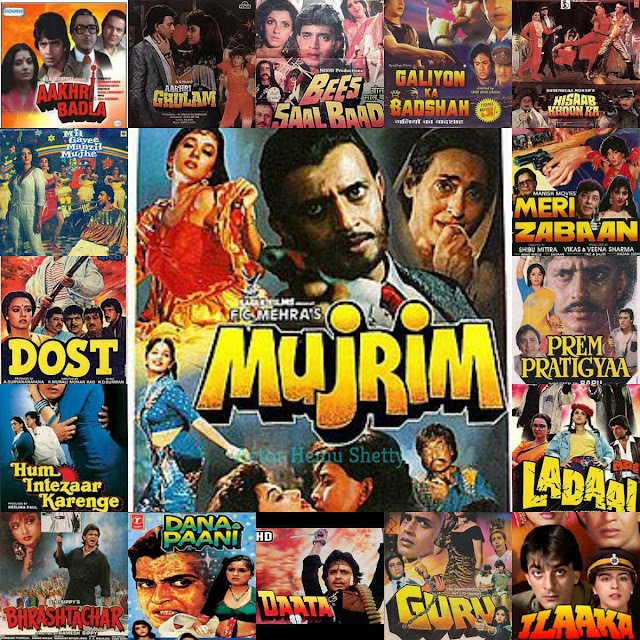 The music in Hindi films had transitioned from classical to electronic-pop, and Disco Dancer was one of the first films, or the most popular one, to embrace the change. Till today Mithun is credited with bringing western nuances in the Indian filmy dance. It was a time when the film's music sold the film. It turned him into a star, and he was one of the highest paid actors in the industry, second to Amitabh Bachchan. Mithun Chakraborty ruled and owned the '80s, it was his decade, the decade of his films and him stamping the box-offices. He acted in many films, gave a great number of hits and had a successful run in the theaters. The peak came when he worked on 19 films in 1989 alone, which is still a record, adjudged and documented by the renowned Limca Book of Records. Just a specimen of his popularity back then. He worked on all kinds of projects, big or small, in the '90s as well, a decade that saw the arrival and rise of a fresh batch of youngsters craving for stardom. In Spite of newcomers and oldies, his popularity, legendary work and his body of films are still regaining in minds of film lovers.